Hello and welcome to Step Out And Thrive Ministries! My name is Bethany Boring and I am proud to be called a child of God before any other title or role. I am a mom to 3 amazing boys. 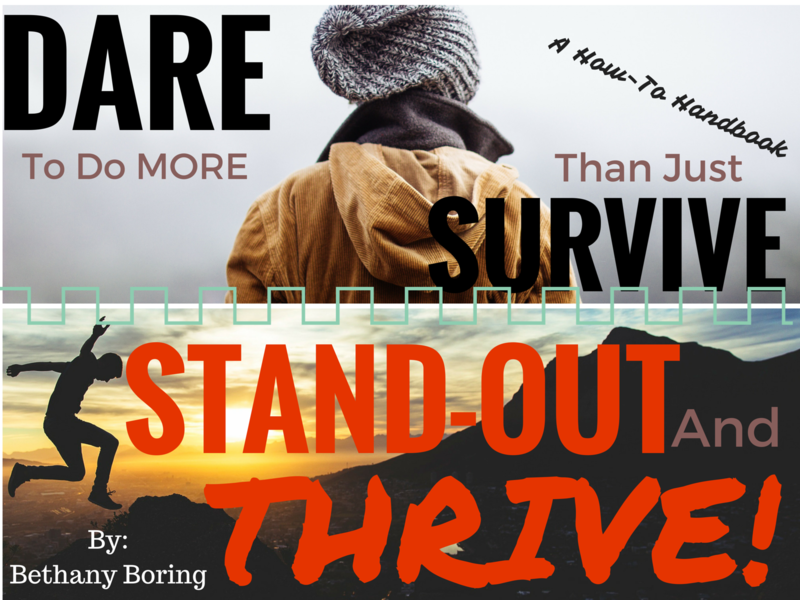 I enjoy writing for this Step Out And Thrive community and walking with you as we venture through the ups and downs of life together. I am also an ICF trained Certified Professional Christian Life Coach (proud Christian Coach Institute Graduate CPLC), Certified Human Behavioral Consultant (DISC Personality), trained and experienced group coach, inspirational and motivational speaker, mentor to women and an author. My dream for Step Out And Thrive Ministries is to create a safe place both in-person and online for survivors to discover who they are outside of their circumstances. The term “survivor” can apply to all of us. All humanity conquers pain in various ways. Unfortunately, many of our ways include numbing, running away, disregarding or excusing it away. Step Out And Thrive Ministries is dedicated to the few and brave who choose daily to trust God at His Word and allow His Promises to rekindle the fire in their hearts. Thrivers here choose to take the next best step through their life circumstances, dancing in His grace and resting in His embrace. We choose not to dwell on where we have been but instead use the power of His testimony through our lives to propel us forward. As the main author of this website, I can promise you that I am flawed in many ways. But you will discover a heart that has been overtaken by the love of Christ and a Spirit-led ministry. All I know is that I once thought thriving in life meant achieving your dreams and creating value in all that you do. Although that sounds appealing, it will not satisfy the longing of my heart for more. God has been showing me that thriving in life begins when my dreams are fully in His hands and my deepest value is simply to be closer to Him. That’s it. No doing more but simply being His first. Thriving is a journey where we grow more each and every day. This site and community exists to grow and learn from one another. I want to hear and see how God is moving in your life. I would love to feature your testimony. I want to connect with you on social media, online groups and coaching opportunities. Let’s connect. Let’s share. Let’s do more than just survive. Let’s step out and thrive!